Ousmane Dembele returned from a hamstring injury layoff on Saturday and played 67 minutes of Barcelona's 0-0 draw against Huesca in the La Liga. With Coutinho playing like a shadow of himself, the Blaugrana manager Ernesto Valverde may be forced to bench him and play Dembele on the left flank as Barcelona look to win at the Nou Camp against Manchester United on Tuesday night in the return leg of the UEFA Champions League Quarter Finals. Dembele or Coutinho - who will start against United? Barcelona hasn't progressed past the Quarterfinals stage of the UEFA Champions League in the past three seasons and the pressure is immense on Valverde to deliver, especially since the La Liga is already in the bag. The defending champions Barcelona are 9 points clear at the top of the La Liga table, with only 8 games to go. Barcelona carry a 1 goal advantage going into the fixture, but cannot take Manchester United for granted, especially considering the kind of fight and desire they showed to overcome a 2-0 first leg deficit to Paris Saint Germain with a 3-1 victory in Paris. Coutinho has failed to hit the heights that he achieved during his Liverpool time, in his time at Barcelona and he was particularly disappointing against United, managing just one shot and one key pass in the first leg at Old Trafford. A statistical comparison between him and the 21-year-old Frenchmen shows that they are neck to neck in most parameters, but Dembele has had more impact in terms of match-winning ability. The mercurial Frenchmen has won 3 Man of the Match awards compared to Coutinho's 1, providing more match-winning contributions to the Blaugrana than the off-colour Brazilian. 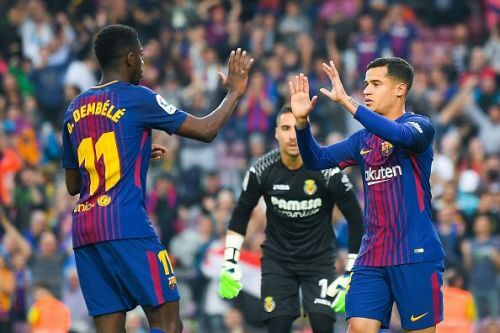 A statistical comparison of their most recent matches goes to show that even though Dembele has just returned from injury, he has had more impact on the Barcelona gameplay than Coutinho. His pace and trickery will be keen as Barcelona look to reduce the burden on Messi, especially considering the physical marketing employed by United's Chris Smalling and Scott McTominay in the first leg. Barcelona face off against Manchester United, at home at the Nou Camp on Wednesday, 12:30 pm Indian Standard Time.